Enjoy amazing views 80 metres (260 feets) above the Southern Tenerife’s Coast. Parascending also known as parassailing it’s a fun and safe activity suitable for everybody. 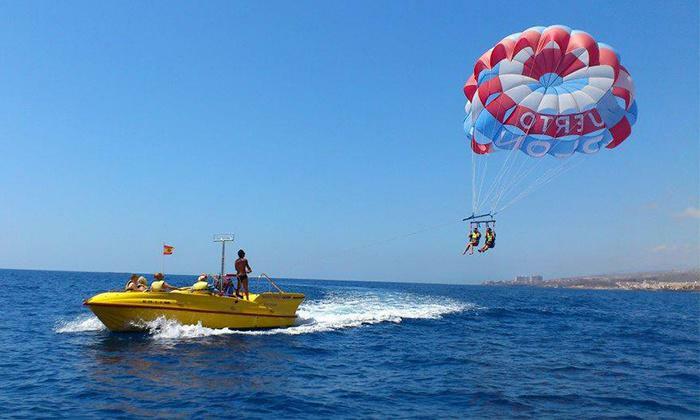 We provide parasailing for all the main resorts in the south of Tenerife, covering zone from Los Cristianos to Las Americas, Puerto Colón, Torviscas, Fañabe and Bahía del Duque. The tour starts in Puerto Colon by the speed boat. There you will be attached to the parachute and all the safety equipment, it doesn’t require any effort from you, so just relax and enjoy the views. At the end of the flight the crew will make you dip your legs into the water before landing on the boat. It is fun and totally safe. Time in the air is approx. 10-15 min long flight and the total time o the whole tour is approx. 45min (including boat trip and preparation).The minimum age is 8 years old. In order to make your booking of PARASCENDING Fly over the Ocean easy and comfortable Tenerife Host use the most advanced and user friendly booking platform TripsPoint.com where you can easily check last actual prices, the tour availability, required booking deposit and book this tour. To get more information of PARASCENDING Fly over the Ocean and do booking, please, click the button ‘Book Now’. You will be taken to the tour page at TripsPoint.com where you can easily book the tour. Once the booking of PARASCENDING Fly over the Ocean made at TripsPoint you will get your tour Voucher / booking confirmation with all details, including exact pick-up point with pick-up time and map. 39€ – per person (8+ years old). You will have to reach to the collecting point in Puerto Colon by walk or taxi.